Perhaps your New Year’s resolution to eat healthy fell by the wayside at that Super Bowl party (and on Valentine’s Day, Fat Tuesday … why are there so many food-related happenings in winter?!). Or, perhaps you were waiting for just the right time to launch your new eating plan – and that time hasn’t quite happened yet. No worries. 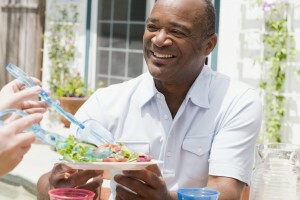 Any day is a good day to launch healthier eating habits. Micca Donohoo, a registered dietitian with Memorial Weight Loss & Wellness Center, offers these 10 tips to get you started. These tips are so easy, you’ll have no problems sticking to them. Don’t skip meals. Our bodies and brains need calories on a routine basis throughout the day. Eating every three to four hours will spread your calories/energy evenly throughout the day and prevent you from becoming overly hungry and succumbing to that tempting plate of chocolate chip cookies. Plan ahead. When we fail to plan, we plan to fail! Fast food and vending machines aren’t nearly as tempting when a packed lunch is waiting in the fridge and healthy snacks are within reach. Pack a bag with weekly daytime snacks to have on hand, and use dinner leftovers as part of your lunch the next day. Eat a balanced plate. Balance is important of all aspects of life but especially helpful when trying to adapt a healthier eating style. Choose a plate that is 9 inches in diameter; divide the plate so that half contains non-starchy vegetables, one-quarter is lean protein and one-quarter is a starch or starchy vegetables. Add a side of fruit or serving of low-fat milk to round it out. This provides instant portion control, a variety of vitamins/minerals and a mix of complex carbohydrates, fiber and protein to keep us full for a longer time period. Eat more fiber. Fiber is a type of carbohydrate that our bodies are unable to digest, yet as our bodies try to process it, it keeps us satisfied for a longer timeframe. Fiber is also helpful for cholesterol reduction and keeping our bowels healthy. Add fruits and veggies to round your plate at meals and snacks, and look for grain products with 3 grams or higher of dietary fiber per serving for the most bang for your buck. Watch for refined sugars. Refined sugars are hidden in many places these days. Found in things like beverages, granola bars, cereals and coffee drinks, they can increase a calorie count but provide no nutrition in return. Choose foods with less than 10 grams of added sugar per serving. Stay hydrated. Our bodies are made up of 60-70 percent water. Drinking plenty of fluids can assist in controlling calories, improvement in energy levels, kidney and bowel health, as well as muscle health. Try a glass of water with lemon or decaffeinated tea to add to your goal of 64 ounces per day. Eat slower. It takes 20 minutes for your brain and your stomach to decide if it satisfied with the meal you have consumed. Try setting your fork down between bites and chewing foods 20 times before swallowing to assist in portion control and savoring the foods at hand. Establish a designated eating area. Eating meals/snacks in a designated area allows us to recognize when we are truly satisfied and give the brain the opportunity to associate meals in a specific place. Keep a food diary. Individuals who keep food diaries lose more weight and are more successful at meeting their health goals. Awareness is the key to change! Be persistent. Don’t give up! Healthy habits are not created overnight but rather are steps that must be practiced each day. Look at each day as an opportunity to improve the next and celebrate your successes.